Here’s the link to make beautiful, low carb fruit salad with raspberry sauce– follow the step-by-step video!Make this beautiful fruit salad! Follow the video link to make beautiful fruit salad with a no-sugar, low carb raspberry sauce. I’ve made this with all kinds of fruit–and it’s always been a big hit at my dinner parties or when I’ve brought it to others. One thing that makes it look so beautiful is to make sure that you add a variety of colors, using fruits such as kiwi, for green, peaches/nectarines in summer for orange/yellow, oranges/tangerines for the same in winter, blueberries and raspberries, etc. The raspberry sauce is made with frozen berries, so the season doesn’t matter. It’s so good and a great dessert for those who want a delicious, sweet, yet low carb treat. 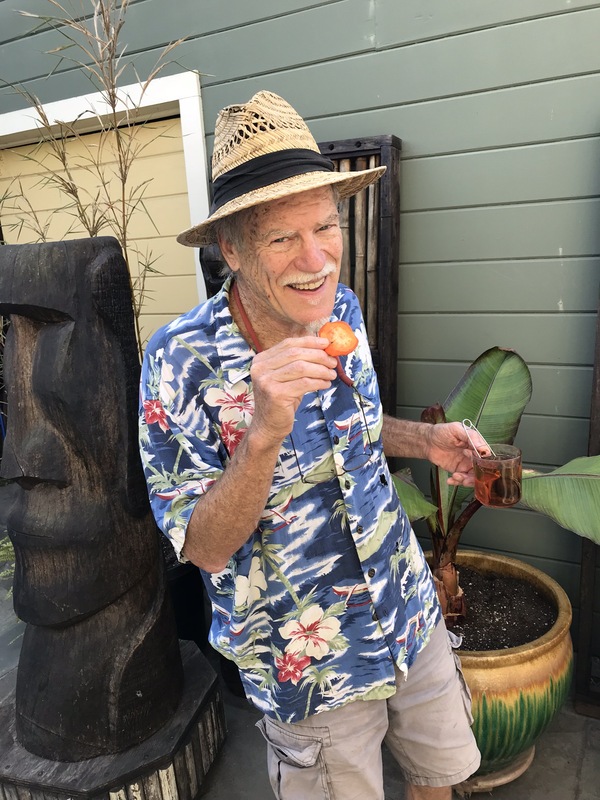 My brother Dan Mainzer, a professional photographer/videographer, (Mainzerphotography.com) was here in Santa Cruz last winter, and we collaborated on a series of three recipe videos. 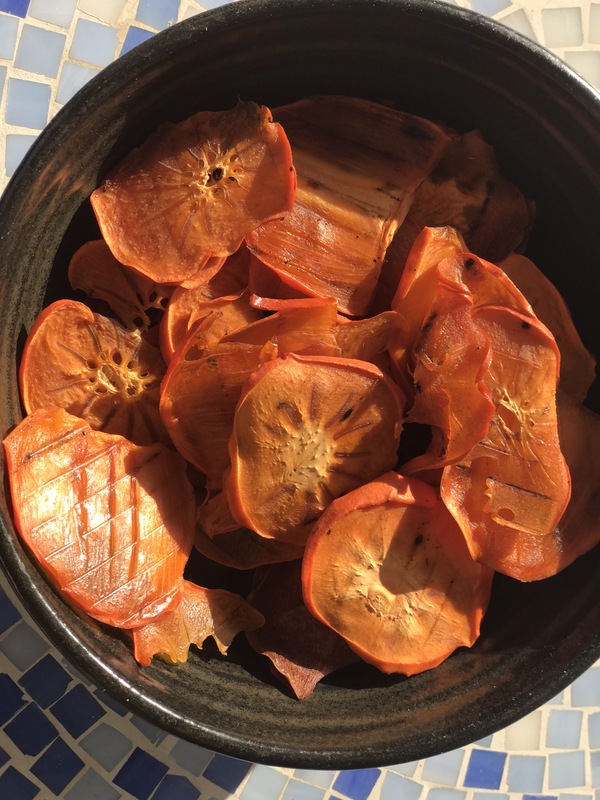 Hope you’ve seen the first one, how to roast Delicata Squash, now followed by How to Create a Fruit Salad with No-Sugar Raspberry Sauce, and coming soon, a Making a Scrumptious Cheesy Appetizer. I hope you like them! Please let me know if you have any questions or comments. We had an abundance of plums this year! This was a year we had sufficient rain and that made a big difference–last year due to the CA drought we had barely any crop. Now the tree was laden with Santa Rosa plums; the boughs touched the ground as they were so heavy with fruit. Sounds wonderful and it was, but we had so many that even after giving away boxes of them to our neighbors, we had a lot left. So of course I made plum jam! It’s a big favorite with my family (I’ve made it many times over the years), but this year there’s the challenge of not using sugar. Turned out, Xylitol works great. This jam is as delicious as the sugary kind (we don’t like it too sweet anyway), with full tasting, gorgeous, purple, plummy goodness. Great for gifts if you can part with it! I use a few shortcuts in that I sterilize the jars in the dishwasher on the hottest setting and also boil the lids/caps instead of using a water bath for the filled jars. I use the canning method I describe below, and it comes out great. * Also, the traditional SureJell method link is below. Pit plums. Do not peel. 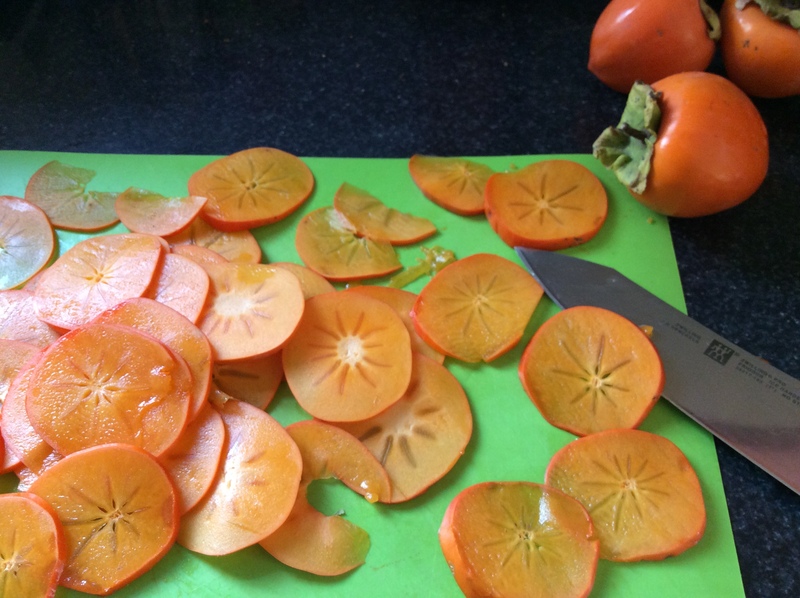 Finely chop or grind fruit or use an immersion blender in deep saucepan or dutch oven. Add water. Bring to boil. Reduce heat; cover and simmer 5 min. Boil lids and rings (2-piece lids). Keep in boiling water until jam is ready. Stir low sugar pectin into fruit in saucepot. Add butter to reduce foaming. Bring mixture to full rolling boil (a boil that doesn’t stop bubbling when stirred) on medium high heat, stirring constantly. Stir in Xylitol, lemon juice, (and cinnamon, if desired). Return to full rolling boil and boil exactly 1 min., stirring constantly. Remove from heat. Skim off any foam with metal spoon. It’s fresh fruit season! Our apple tree is full of fruit and apples are dropping all over our yard. So naturally it’s applesauce time! I realize that usually apples are an autumn crop but somehow ours are ripe now. My grandma made the best applesauce –kinda chunky yet tender and very flavorful. Her secret was use mainly white wine, lemon juice, cinnamon and a very little water, if any. And yes, sugar. It was always a special treat. And now there’s a way to make Gran’s applesauce without sugar or weird tasting substitutes. I use it sparingly in any case, but it definitely makes desserts such as this tasty cinnamon applesauce very satisfying without sacrificing flavor. It’s also easy to make (and smells divine while cooking). I’m sure it will become a staple in your household as it is in mine! I also make a delicious fresh plum jam using Xylitol and no sugar; recipe to come. 1/2 cup white wine (I like to use any Sauvignon Blanc from Marlborough area of New Zealand); you may add more if the apples are too dry. Rinse, peel and chop the apples; you can leave some skin on; chop roughly into about 1″ pieces. 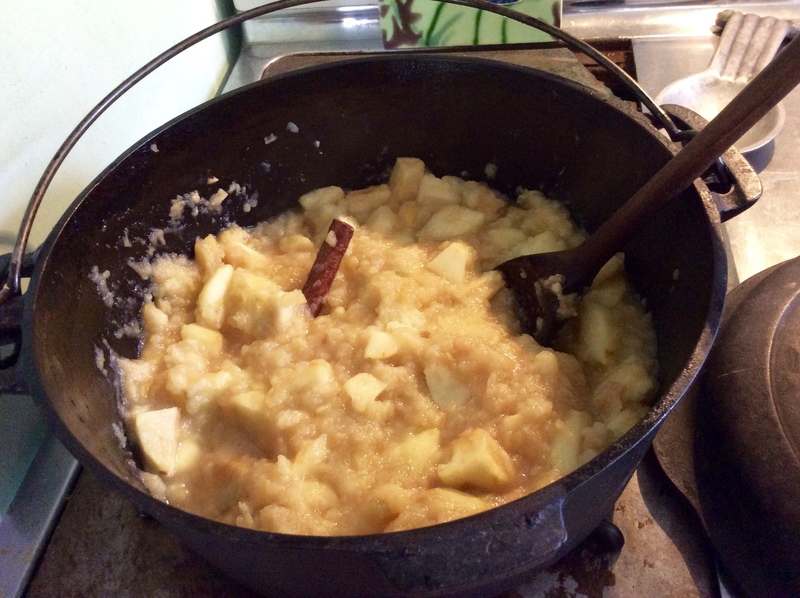 Add apple pieces into a large cast iron or dutch oven, on the stovetop with medium high heat. Add white wine and Xylitol, and cinnamon stick. Stir constantly, until the apples are bubbling. Cover and turn down the heat to low, and cook for approximately 1/2 hr., stirring every so often, until the apples are tender. Add additional liquid in small amounts as needed (apples should be moist). Add lemon juice and ground cinnamon to taste. 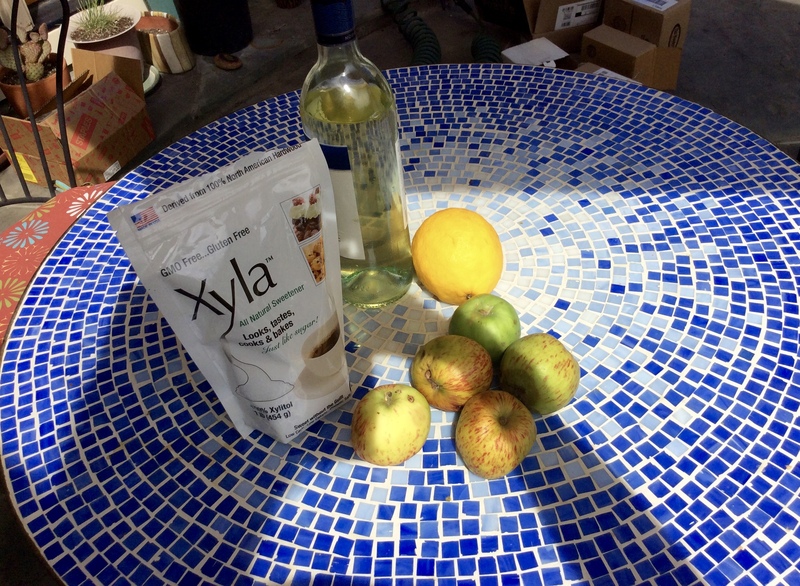 I also use Xylotol in my fresh applesauce; recipe to come. Make the sauce first so the flavors can meld. Pour the frozen raspberries into a deep sided mixing bowl. Let sit for 1/2 hr. to thaw slightly or thaw 3-4 minutes in a microwave. They should still be somewhat frozen. Add rum, cognac or water and Xylotol. Using a hand mixer or stick immersion Mini pimmer, mix til the consistency is thick but liquid enough to pour; somewhat the consistency of Hollandaise sauce. Add lemon juice and additional liquid in small amounts if needed. 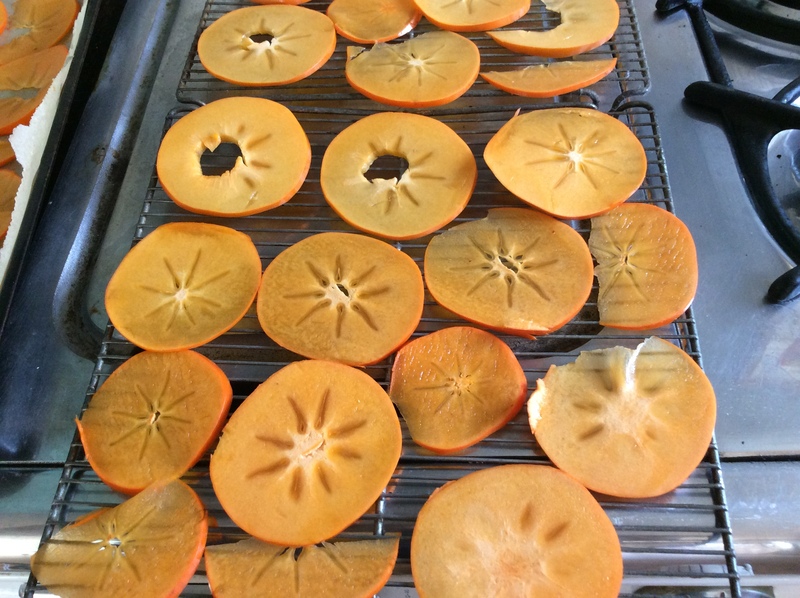 Lay fruit in a circular pattern on a large round, preferably glass, plate or platter. Start with larger pieces, then smaller on top, (I like the Kiwii rounds on the top of the orange pieces), with edges overlapping. Finish with berries as a garnish. Serve with sauce; I add a bit over the plate and offer the rest of the sauce in a gravy dish with a small ladle. * I’ve produced a video demonstrating making this dessert; to be featured soon on the blog. Stay tuned! This has been the hit of any parties I’ve brought it too. Hopefully you have the same experience!